I received the first issue this year of Royalty Digest Quarterly last Friday just before I left for Mandal in Southern Norway. I had planned to take some days off from my blog activities and not start writing again until the British Royal Wedding, unless something extraordinary took place. It really feels good to relax a few days with family and friends, and there are plenty of family events to take part in, including 70th birthday celebrations, a christening and a confirmation. But I don’t want my traditional summary of RDQ No. 1/2011 to turn into too old news, so I will make this blog article an exception to my original plan. 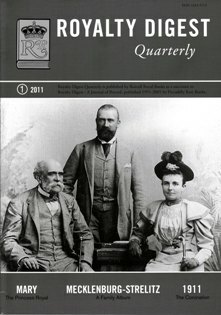 The cover shows a photo from the 1890s of Grand Duke Friedrich Wilhelm of Mecklenburg-Strelitz (1819–1860–1904), his son, the later Grand Duke Adolf Friedrich V (1848–1904–1914) and his daughter-in-law, the later Grand Duchess Elisabeth (1857–1933), who was born Princess of Anhalt. The photo is linked to RDQ’s historical consultant Charlotte Zeepvat’s photo article Mecklenburg-Strelitz. A Family Album, which besides a presentation of the grand ducal house contains 19 pages with photos of the family members (71 photos in all) and a 3 pages’ long genealogical survey. Later in the magazine she has also contributed to another article, Chère Hélène [Or, keep your eyes peeled, you never know what you might find]. 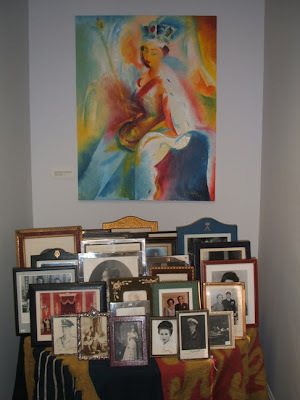 It deals with two postcards – the first, dated 1902, had the portrait of Prince Friedrich Günther of Schwarzburg(-Rudolstadt) (1901–1971), the other, which was undated, also including his father Prince Sizzo, mother Alexandra, née Princess of Anhalt, and sisters Marie-Antoinette and Irene. It is nice when such lesser known princely houses are in focus! The postcards were written by a governess to a friend. And if that was not enough, Zeepvat is also author of another photo article, Of such magnificence, covering a costume ball during Queen Victoria’s Diamond Jubilee in 1897. In his Editor’s column the publisher Ted Rosvall comments on the future wedding between the head of the Prussian Royal Family, Prince Georg Friedrich, and Princess Sophie of Isenburg. He points out that also her two sisters Katharina and Isabelle have married within the Gotha, and wonders if this is the start of a revival of equal marriages. Probably not, he adds, as I would also have written! But a nice union it is, nevertheless. As it has turned out, I am going to Berlin on a work trip the last weekend of August this year, and that is when the royal wedding is taking place. I will not be able to Potsdam on the wedding day, though. Robert Prentice has written a nice presentation of Princess Mary of the United Kingdom, Princess Royal (1897–1965), the only daughter of the then Duke and Duchess of York, later King George V and Queen Mary. She married Viscount Lascelles, later the 6th Earl of Harewood, in 1922 and had two children – George and Gerald. Michael L. Nash has contributed with an article on The 1911 Coronation of King George V and Queen Mary, while Marion Wynn takes a look at the British Gardeners at the Russian Court. Alberto Penna Rodrigues and Janet Ashton are co-authors of the article A difficult relationship… Queen Maria Pia and Dona Antonia, referring to King Luiz’ consort and his younger sister. The former was the daughter of King Vittorio Emanuele II, the latter married Prince Leopold of Sigmaringen. In addition you will as usual find book reviews and a short news column. If I dare to make a suggestion for the RDQ, it would be to include a short presentation of the authors ot the various contributions. It would be nice to learn a few basic facts to know their background. 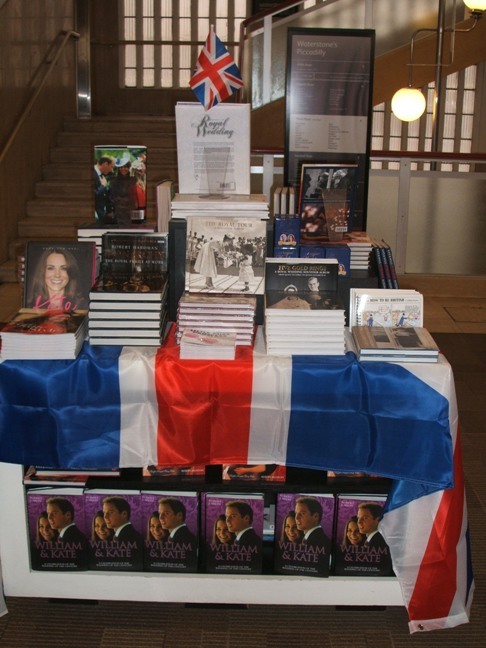 Royalty Digest Quarterly is published by Roosvall Royal Books, which can be contacted by e-mail royalbooks[at]telia.com. Subscriptions for 2011 are SEK 440 within Europe and SEK 480 outside Europe. For earlier presentations of Royalty Digest Quarterly, go here. Ticehurst and Flimwell Primary School, East Sussex. 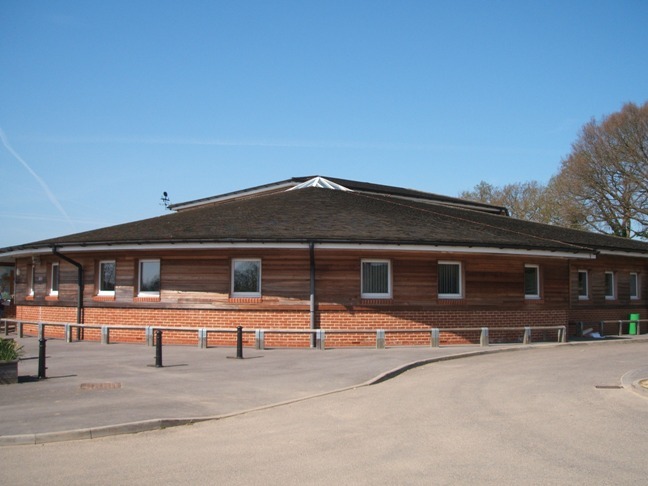 On 9-10 April I attended for the first time the annual Royalty Weekend conference held at Ticehurst and Flimwell Primary School in Ticehurst, East Sussex. I had wanted to attend several times before, but never got my act together before this year. I usually travel to England once a year to watch football – my favourite team is Norwich City FC, and I am a founding member of the Scandinavian supporters’ club – and more than one trip to England a year has not really been on my priority list. So this must be one of the first trips to England in a long time that I haven’t watched any football «live» at all. Norwich was playing away to Swansea on Saturday evening and lost deservingly 0-3. I guess I made the right choice this time! My football trips to either Norwich or London are usually combined with book shopping etc. and sightseeing. The conference at Ticehurst could of course easily be combined with what I consider as «musts» in London. And it had been years since I visited East Sussex last time – I think I paid Hastings a visit in the early 1990s – but I had never been to this part of the county. Ticehurst is close to Cranbrook in Kent, where I have been several times, as my family has friends there. I travelled down to Wadhurst, the railway station closest to Ticehurst, on Friday 8th, by train. It stopped among others at Chislehurst (in the London borough of Bromley), which was the death place of Emperor Napoleon III. I didn’t reflect on this on my way down, but fortunately this historical fact was pointed out to me when a group of the conference attendees travelled together back to London again by train on Sunday evening. The Royalty Weekend conference – which has been arranged around 15 times now – gives a great opportunity to learn more about various royalty topics, to meet and get inspired by people who have a great knowledge in the field and who share your interest. I had only met a couple of the 83 persons attending the conference before, but I had been in contact with some others on the Internet for many years, so it was nice to meet them face to face finally. And I was able to make new contacts as well. People came from all over the world – Australia, the United States, Canada, the Netherlands, Sweden, Denmark and Norway besides the United Kingdom. So many lovely and interesting people gathered at the same place! We were also blessed with fantastic good and warm weather on both days, which made the stay even more enjoyable – the breaks were spent outdoors in the sun, and it was nice to walk around in the village afterwards. The conference was opened on Saturday morning by Richard Thornton, who acted as a compère throughout the weekend. The first man out to hold a lecture was Ian Shapiro, who read from the letters which the British Prince Alfred’s former governor Sir John Cowell, Master of Queen Victoria’s Household, wrote home when he attended the funeral of Emperor Alexander II in 1881. Shapiro then handed over the baton to the historian, russianist and writer Helen Rappaport, who told about her new book, Magnificent Obsession. Victoria, Albert and the Death that Changed the Monarchy, which will be published on 3 November 2011, as well as about her new, ongoing book project, Four Sisters. The Vanished World of the Romanov Daughters, planned to be published in 2013. Following the lunch break, Karen Ashton did a good job in presenting The Constitutional Monarchy Association. I used to be a member of its sister organisation, The Monarchist League in the 1990s. 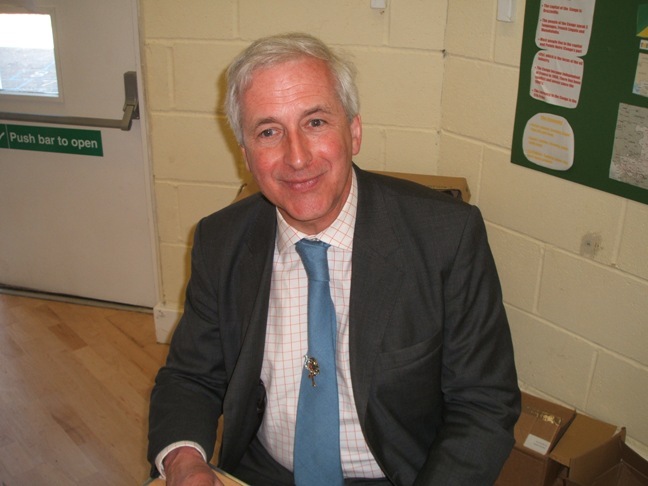 The author Hugo Vickers, one of the speakers at the conference. The name Hugo Vickers should be well known to everyone who is interested in reading about royalty. He has among others written the biographies Alice, Princess Andrew of Greece (2000) – one of the best biographies I have ever read – and Elizabeth the Queen Mother 82005), which I own a copy of, but for some reason have not got to read yet. Vickers’ latest book is titled Behind closed doors. The tragic, untold story of the Duchess of Windsor, which was also the topic for his lecture. Normally I would have skipped buying yet another biography about the Duchess of Windsor, but I couldn’t resist the chance to get a signed copy! I bought it before the lecture, even, and fortunately I was not disappointed. I look forward to reading it! The last topic of the day was Before and After the Deluge: a selection of Royal Letters, presented by the Romania royal family expert John Wimbles. Most, if not all, of the letters had a Romanian connection. 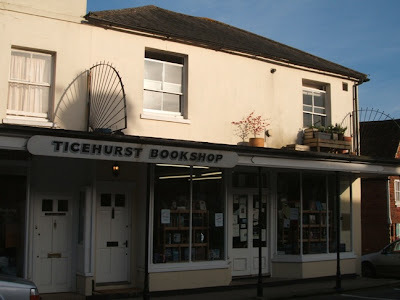 The Ticehurst Bookstore, the wheel behind the conference, in latter years with the help of among others Sue Woolmans. Before the dinner on Saturday evening many participants took the opportunity to visit The Ticehurst Bookstore, which was situated 2-3 miles away from the primary school. It was nice to finally see the bookstore which I have been in contact with for so many years, although not as frequent after the periodical Royalty Digest was closed down. The periodical later got a successor in Royalty Digest Quarterly, published by Rosvall Royal Books. There were many interesting titles in the shelves, but as I couldn’t bring with me home the whole store, I had to limit myself. I ended up with buying the very outdated A Genealogy of the Romanov Dynasty. The Imperial House of Russia 1825-1994, by Pieter Broek. The main reason is that I had lost the copy I once owned and just wanted to secure another copy before it possibly got sold out. In addition I got myself volume 2 of Royalty Digest (June 1992–June 1993). I believe I started to subscribe to the periodical from 1995 onwards, so I wanted to secure what I had missed out on. I also took the time to visit the churchyard of the 14th century St. Mary’s Church – an independent article will appear soon – before I returned to the school for the dinner. I can assure the blog readers that no-one was left hungry – the food was just superb, as was the lunches on both days. Allan Raymond, who runs a website on among others the European royal families and is a trustee of the genealogical site FreeBMD, which transcribes the Birth, Marriage and Death Index for England and Wales, opened the ball on Sunday morning with his lecture The Gardener who married a Princess: Imma of Erbach-Schönberg). «The Gardener» was Neil Boyd Watson McEacharn (1884-1964), and Raymond had done a great deal of research on his family. I really hope we can talk Allan into making an article out his lecture! Following a tea/coffee break the historical consultant to RDQ, Charlotte Zeepvat, who is the author of numerous books and articles on royal families, took us through Diddo, Arnold and the URGE. Life in the household of Archduke Anton of Austria, based on letters the family’s British governess sent home. A wonderful lecture, and fortunately an article will soon turn up in RDQ. If anyone wonders, «Diddo» was the code name for the governess, «Arnold» was Archduchess Ileana, née Princess of Romania, while «the Urge» was identical to Archduke Anton of Austria. After lunch it was the editor and publisher Ted Rosvall’s turn with the topic Madame Royale and the Dunkelgräfin. Madame Royale was of course Marie Thérèse of France, Countess of Marnes, b. 1778, the oldest daughter of King Louis XVI and Queen Marie Antoinette, née Archduchess of Austria. Marie Thérèse married in 1799 her first cousin Louis Antoine, Duke d'Angoulême. She died in 1851 and was buried in Görtz (today Nova Gorica, Slovenia). Or was she? Could she have been replaced by her childhood friend Ernestine Lambriquet when she left France? Was she identical with the so-called Dunkelgräfin of Hildburghausen (the «Dark Countess of Hildburghausen»?) See Interessenkreis “Madame Royale” for more details. No, I don’t buy such substitution stories but Rosvall made a great presentation of it, even talking without a manuscript. Rosvall also made an advertisement for the planned Royalty Digest Quarterly Tour titled «Royal Stockholm 2012», scheduled for 12–15 July 2012. Royal watchers are invited to enjoy the many royal sights of «The Venice of the North», Sweden’s capital, including the Royal Palace, the royal burial places, Drottningholm, Ulriksdal, Tullgarn and much more. Contact Rosvall, royalbooks [at] telia.com for details and a provisional program. Stands at the conference in connection with the topic A Royal Exile. The last speaker was Neil Rees, author of A Royal Exile: King Zog and Queen Geraldine of Albania including their wartime exile in the Thames Valley and Chilterns (2010), which I had bought already on Saturday. His chosen topic for the day was The Zoglets: King Zog’s sisters. 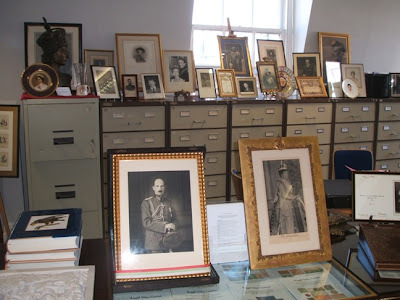 Balkan royalty is – although I have not written much about it in my blog – one of my greatest interests, so I was very happy with the topic – and with the lecture as well. After he was finished, I rushed to buy a CD that was also for sale and which was titled A Royal Exile. The CD contained pictures and personal recollections given at the Albanian Heritage Day at Parmoor House, the residence of King Zog 1941–1946. In a short questions – answers session Mr. Rees also told about planned events in Albania in 2012, including the celebration of the 100th anniversary of Albanian independence. Prince Leka is getting married to his fiancée, Elia Zaharia, and if everything goes as planned, the bodies of King Zog, his sisters and other relatives will be moved from the Cimetière de Thiais in Paris to a new mausoleum in Tirana. 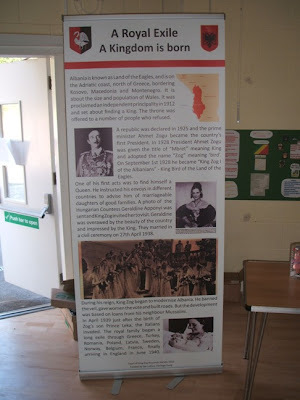 See also the website Albanians in exile for more information about King Zog and his family. No time was given for questions following the other lectures, but as it was pointed out, most of the speakers were present at the conference throughout the weekend, so there was plenty of opportunity to discuss the various topics with them. All in all I found the conference to have been a great success, and I met many nice and interesting persons who had a great knowledge in the field. All the lectures gave – at least to me – new insight. Of course some had more experience in lecturing than others, and naturally I was more interested in some of the topics than in others, but from the bottom of my heart I can tell that I found all the lectures interesting and I learned a lot from them. Besides lectures and socializing, there were also stands where one could buy books, post cards, memorabilia etc. As already told I made one trip to the bookstore in Ticehurst, but I also bought yet another book not connected to any of the lectures – The Russian Dukes of Leuchtenberg. Honour and fidelity by Zoia Belyakova (St. Petersburg, 2010). Together with several other participants I returned to London soon after the conference on Sunday evening by train from Wadhurst, which meant that we got even more time to discuss various royal topics. Among them was the film The King’s Speech, which got mixed opinions in the group. One pointed out the scene where (then former) King Edward VIII cried on Queen Mary’s shoulder, but in reality it was the new King George VI who took to tears. I must admit that I did not reflect on this when I watched the movie a few weeks ago. Then again it was the first time my wife and I went to a movie theatre after the birth of our daughter last year, and I had decided to relax and enjoy a good movie and story without focusing on possible mistakes. Hugo Vickers, who was a consultant to the movie, has commented on the historical accuracy to The Guardian in January this year. The next day I had a few hours available before heading to Heathrow for the return flight to Norway. There are certain things I almost always do while in London. One of the «musts» is to visit the Stanley Gibbons stamps shop at Strand. The shop had been totally renovated since my last visit in February 2010, and I was pleased with the changes. The shop had got a more stylish and «modern» look. 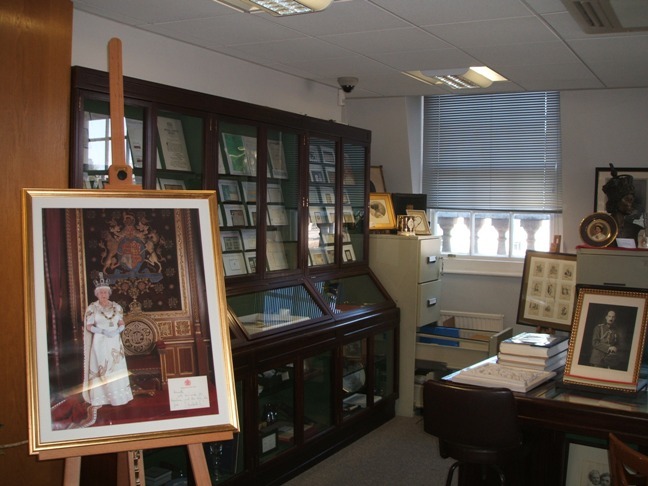 On display was the company’s new publication, Royalty on Stamps. A celebration of the British Royal Family through stamps 1952–2011, which was released to mark the royal engagement of Prince William and Kate Middleton. How about that! It is great when you can combine two hobbies in one! According to the back cover the publication «combines brand new information and specially selected features from the newly released Gibbons Stamp Monthly to provide an anthology of articles featuring the Royal Family». Included are among others the articles Prince William and Kate Middleton (November 2010); 50th Anniversary of the Coronation (June 2003); Prince William on Stamps (August 2000); Elizabeth The Queen Mother (October 1999); 70th Birthday Stamp for HM The Queen (April 1996); Royal Weddings Past and Present (July 1981); Silver Jubilee Survey (June 1977); Stamp Portraits of Princess Anne (November 1973); Royal Silver Wedding (November 1972); Stamps Portraits of the Queen (August 1955) and The Coronation Stamps (July 1953). The booklet was priced at GBP 8,95. I also bought a few stamps commemorating the engagement in November 2010 (stamp sheets from Gibraltar and the Isle of Man) as well as some flag stamps. Of course I also picked up the latest copy of Gibbons Stamp Monthly, which included 6 Prince William/Kate Middleton stamps issued by Cook Islands. The stamps magazine contains among others the articles A Short Introduction to the King George V 1912–24 Royal Cypher Stamps by David Baker and Canada’s Small Queens Issue – Unsolved Mysteries by John Hillson. Another must is a visit to the Twinings tea shop, which is also situated at the Strand opposite the Royal Courts of Justice. Yes, the products can be ordered online as well, and I guess most of them can be found in Oslo too, but it is still nice to drop by. The shop has got a little museum as well. 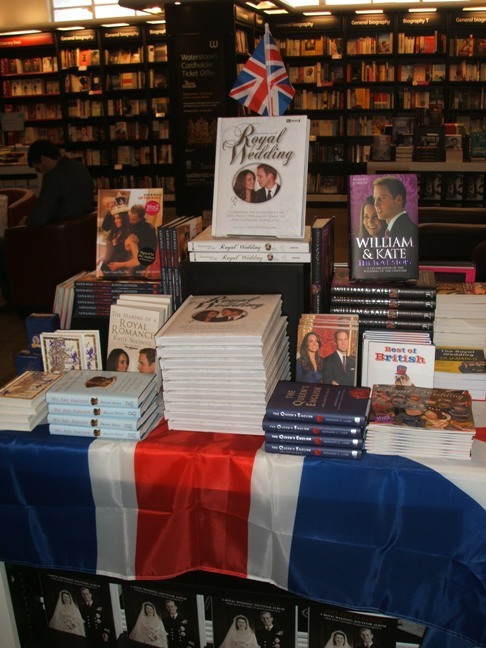 Royal wedding display at Waterstone's. And of course all over London you could buy plenty of souvenirs commemorating the upcoming royal wedding. I normally don’t collect royal memorabilia – although I have a few postcards – but thought it would be fun to own at least one wedding souvenir. I ended up with buying a Royal Wedding 4̎ Bone China Plate and a fridge magnet, both with a photo from the photo session on the day the engagement was officially announced. And just before I was to find the gate at Heathrow, I bought a Royal Wedding tea caddy as well! 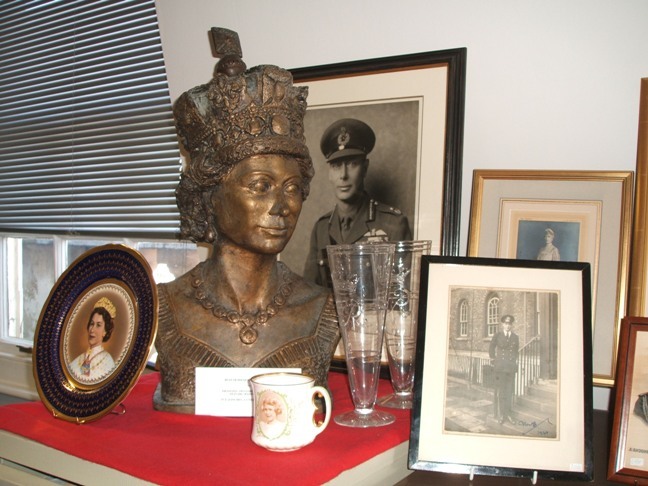 A great collection of royal memorabilia at Argyll Etkin. After lunch my last stop before I had to pick up my suitcase, was Argyll Etkin at the corner of Waterloo Place and Pall Mall, which specializes in stamps, postal history and royal memorabilia. This was my first visit to this shop. One of the managing directors is Ian Shapiro, who held a lecture at the Royalty Weekend. He didn’t comment on the fact that I was among others carrying a Stanley Gibbons bag (! ), but was kind to show me numerous letters and drawings etc. connected to the Norwegian Royal House, including drawings made by Queen Maud when she was a child. The shop was packed with royal memorabilia, just check out the photos! A fitting close to my London visit! The Royalty Weekend 2012 will, by the way, take place on 14–15 April. Two speakers are already booked. I will definitely not rule out that I will attend the conference next year as well – time will show! Denmark: Prince Vincent and Princess Josephine!